The Black Lives Matter Global Network has landed in Australia for the 2017 Sydney Peace Prize. 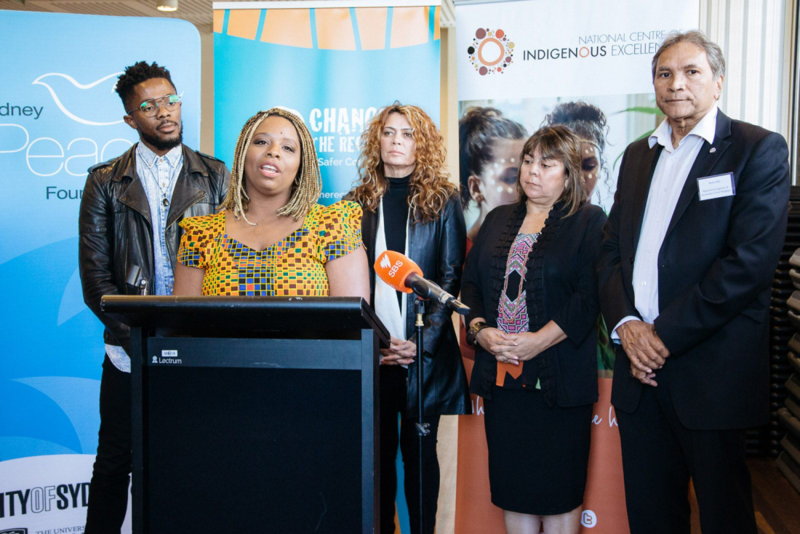 They’ve hit the ground running, and in this past week they have been meeting and building with the Indigenous Australians in Mildura, the Change the Record Coalition in Sydney, and also the local Redfern community for a Black on Black yarning circle. On Saturday they will go on to Melbourne to meet with dozens of young organisers. “This recognition honors the tireless work of thousands of Black folks who have been organizing and mobilizing for Black life across the United States, Canada, the United Kingdom, and around the Globe. It recognizes the impacts that our movement has on the global fight against anti-Black racism and the incredible contributions our movement leaders have made to their local communities and sociopolitical landscapes. This prize is for all of us. The Black Lives Matter Global Network is a leaderful movement lead by folks dedicated to over 40 chapter organisations worldwide. The strength of a long-term movement is in numbers, connection, leadership, learning, authenticity and endurance, none of which are concentrated a single individual. Alicia Garza and Opal Tometi were unable to fly to Australia, but the Sydney Peace Foundation is incredibly honoured that the visionary Black Lives Matter Co-Founder Patrisse Khan-Cullors, Black Lives Matter Toronto Co-Founder Rodney Diverlus and Black Lives Matter Long Beach Organizer Dawn Modkins are in Sydney to accept the Prize on Thursday 2 November (tickets here). “Thanks to the Sydney Peace Foundation for this beautiful recognition of this movement and the contribution of the Network. This award signifies that another world is necessary, and indeed possible if we all rise to the moral mandate of justice and dignity. Although I was unable to travel to receive the award on behalf of the Network the significance is seared upon my heart. And I feel further emboldened to continue the work across the globe. The fact that SPF chose this year to honor our chapters as opposed to honoring one particular person demonstrates an understanding of our collective contributions and the scope of our struggles. This distinction and methodology is apt given the times and the leaderful nature of our current social movements. There are so many people who sacrifice and who have co-created this movement and although not all names will be written about in the history books it’s important we must recognize this work is bigger than any subset of people or one organization. And the mission of building a world where Black lives matter is a commitment that all of us can and should carry. Our commitment is demonstrated in the way we embody our commitment to justice.